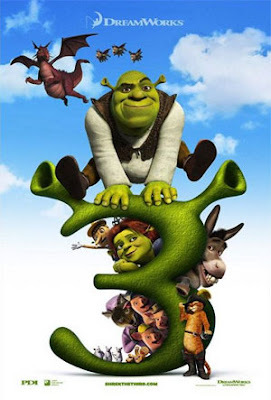 We had a screening at work of Shrek 3 and I actually liked it! I laughed more during the 2nd one, but this one was pretty good. I really like Donkey and Puss, they are great characters and funny as a duo. Gingerbread Man and Pinocchio crack me up as well. The animation of the Frog King and Merlin were fantastic, definitely the highlight for me. The lipsync on Fiona before Shrek leaves on the boat was also really good, very real and not as muppet like. What still doesn't work is the animation on the humans, mainly during broad movements. When they run or fall, they just move way too fast and it doesn't work for me because they look so real, yet move in such a cartoony way. Not my thing. All in all, congrats guys! I love Pinocchio, classic!! haha!! he finally get way not to tell truth...awesome!